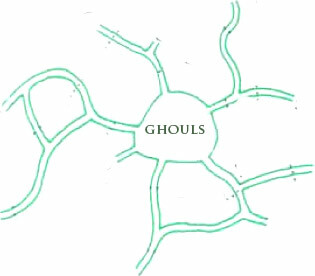 The ghouls cowered, but did not flee. This was where they would make their last stand. Within the eerily glowing illumination cast by the flickering torchlight, the ghouls looked liked creatures from Ludo’s nightmares, he held his sword in the guard position prepared to defend himself and watched as the magical web encased the unholy shrieking creatures, trapping them. Feldard was glad for the greater height of the cavern. Here he could swing his axe with much more effectiveness. As the ghouls became entangled in the webbing cast by Miklos, Feldard went to work, cleaving the undead ‘til all that remained were parts. Initially, Stephan had taken up a position to protect Maruc and Miklos so they could ply their trade. In the aftermath, he followed Feldard’s lead and assisted in piece-mealing the ghouls. Last into the room, Hasan saw little but the efficient dispatch of the horrid ghouls. His elven hands worried over an arrow, half-drawn from the holster that hung by his side. But the elf saw no target. He watched. Though they struggled within the web strands, the ghouls quickly fell under the sword and axe blows from Feldard and Stephan. Ludo wondered how they came to be here and who was their master. The very presence of these creatures indicated that the ‘Sons of Night’ might be active in these parts. Perhaps the mysterious waling sound from outside the cave would answer that question. Once the creatures had been dispatched, the group moved around the cavern, studying a moment each tunnel that radiated out from this central area. Trying not to shine his lightstone so as to disrupt the demi-humans’ vision, Stephan focused on inspecting the cavern and exits. The tunnel system was not large. The various routes led a short way to concealed exits on the surface. Other than small creepy, crawly creatures, the ghouls underground lair now seemed to be empty. “Well it least any remaining rats will have a good meal” Ludo said offhandedly, “yes I agree Stephen let’s investigate this wailing and determine if they are responsible for the slaughter of the three men. Maybe we can use these tunnels to get closer to the wailings source without being detected. Feldard with your natural underground affinity can you guide us in the right direction”? Feldard set off in the lead. Eyes alert for foe and trap, ears straining to hear the faint echo of footfalls that were not their own. Miklos swept his eyes around the cavern. The bones of many victims had been consumed to fed the dark hunger of the ghouls not all of them human. He wondered if this place was some sort of burial site. It would be challenging to bury anyone in stone, perhaps these creatures had a regular supply of bodies? The piked corpses on the road in spoke of a warning, but would the ghouls wish to ward off potential victims? Miklos didn’t think so. Something else was in play here. ‘Lower’ undead were not renowned for hoarding treasure but powerful creatures such as these might inadvertently cast aside a valuable trinket or two. Miklos cast off his Detect Magic spell and searched the debris in the cavern and its tunnels. DM: if Miklos finds anything useful please insert here I think the spell should last 10 mins (not sure) so should give us enough time to investigate the other tunnel before failing. “Good. Let us clear the other tunnel of evil before we depart.” Miklos followed the others. Hasan picked at the detritus alongside Ludo and Miklos. Filth, muck and worse were all the elf found. “Come now,” he said, “More awaits us for sure.” The elf followed Feldard reluctantly. “By all that is holy, I hope we can stay above ground,” the elf compalined to Ludo.